Features Fully Automatic Hydraulic Extrusion Blow Molding Machine for Plastic Packaging Industries. Hydraulic Driven | Bobbing Extruder | 4parison | Double Station Model | * Auto Deflashing & parison controller as optional attachments. 50~500ml. Hydraulically Operated, Fully Automatic Plastic Extrusion Blow Moulding Machine. Suitable to make plastic containers in blow HDPE, LDPE, LLDPE, HM, EVOH, ADFLEX, PP & PVC Raw materials. Suitable for: Medicine packaging bottles, FMCG packaging plastic containers other plastik products packaging. 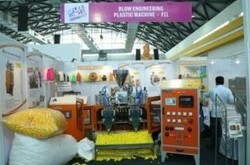 Looking for Multi Parison Plastic Packaging Machine ?